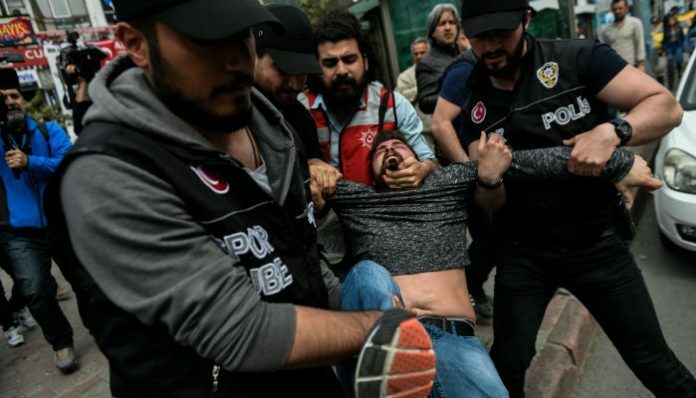 A similar statement by the İstanbul Governor’s Office said that riot police detained at least 207 people during the celebrations throughout Sunday. Celebrations were held across Turkey to mark May Day under strict security measures due to a state of emergency declared in the aftermath of a failed coup attempt on July 15, while the symbolic venue of such celebrations, İstanbul’s Taksim Square, remained closed to festivities. A total of 30,000 police officers have been deployed in İstanbul to maintain security during the celebrations while demonstrators are not allowed to enter Taksim Square, where thousands of police officers are on duty. Two individuals who wanted to unfurl a banner in Taksim Square were detained on Monday morning. Police officers reportedly took photos of every banner that was brought by demonstrators to the area, and words such as KHK, or government decree, and OHAL, or state of emergency, were cut out of the banners. Major labor unions such as the Confederation of Revolutionary Workers’ Unions (DİSK), the Confederation of Public Sector Trade Unions (KESK) and the Turkish Union of Engineers and Architects’ Chambers (TMMOB) gathered in the public bazaar in İstanbul’s Bakırköy neighborhood to mark May Day. Until 2009, Taksim was off limits to demonstrators following May Day 1977, also known as Bloody May Day, when 34 people were killed after unknown assailants opened fire on the crowd. Since then, May Day in Turkey has always been a source of tension. In 2009, the government decided to declare May Day an official holiday and opened Taksim Square up for festivities. About three decades after Bloody May Day, under tight security, Taksim Square became the venue of peaceful celebrations aside from a few minor incidents in 2010, 2011 and 2012. Yet, Turkey has been engaged in the same debates on Taksim for the past four years. In Ankara, the venues of the celebrations were Kolej Square and Tandoğan Square.